Gartner has reported the total worldwide semiconductor device revenue reached $315 billion in 2013, up 5 percent from 2012. The combined revenue of the top 25 semiconductor vendors increased by 6.9 percent during 2013, where memory chip market increased 23.5 percent in 2013, according to Gartner. Intel continue to stay ahead of the rest, even though its revenue down by 1 percent due to lesser PC sales. On the semiconductor equipment market for the year 2013 Gartner says worldwide semiconductor capital equipment spending totaled $33.8 billion in 2013, an 11.5 percent decline from 2012. Wafer-level manufacturing equipment demand performed above the market with strength in lithography and associated processes, while back-end manufacturing segments fared significantly worse than average, as per Gartner. Applied Materials lead in ranking due to its strength in deposition and etch followed by ASML, Lam Research. The semiconductor material market has nearly doubled from 2003 to 2013. In 2003 it was around US dollar 23-24 billion and in 2013 it is estimated by SEMI that the total semiconductor material market of US dollar 43.5 billion. 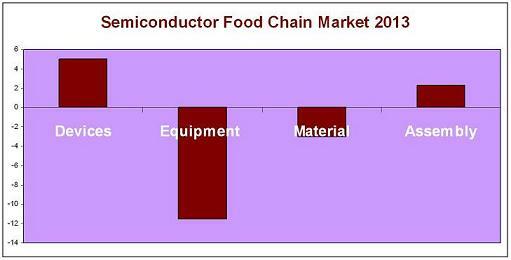 However from 2012 to 2013, the semiconductor material market is down by 3%, as per SEMI. Worldwide semiconductor assembly and test services (SATS) market totaled $25.1 billion in 2013, a 2.3 percent increase from 2012, according to very recent release by Gartner. The top three vendors, ASE, Amkor Technology and SPIL, grew faster than the market average, and took market share away from other, lower-ranked companies, says Gartner.